(MP493). Alma Claude Burlton Cull (1880-1931). watercolour; signed (lower left). This watercolour by Alma Cull has been signed, unusually for him, in pencil and is not dated: but inspection of key features of the battle cruiser show that this painting of the ship was executed in 1929/1930 only a few years before the artist’s death at the young age of 51. She was under the command of Captain G C Dickens CMG RN. Her foretopmast, fitted for the period when HRH The Prince of Wales was onboard for the tour of South America in 1924-25, has been landed and B (and Y turret) still have their flying off platforms fitted: these were removed in the 1930s refits of both REPULSE and RENOWN. 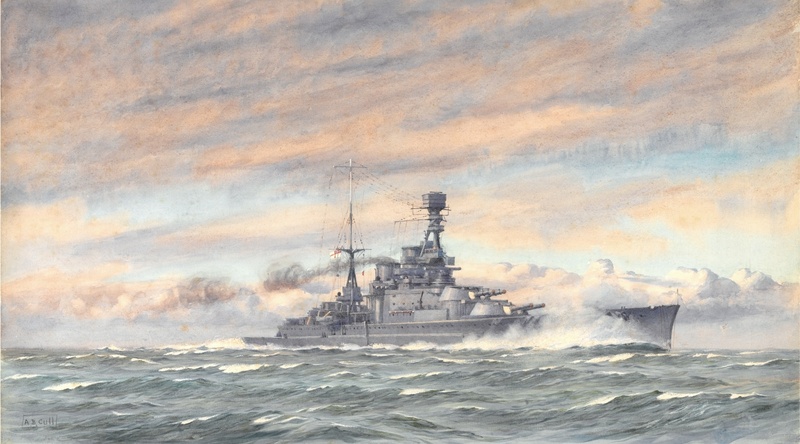 The 1914/15 Warship Building Programme included 4 new battleships: AGINCOURT of the Queen Elizabeth Class; and RESISTANCE, REPULSE and RENOWN of a modified R Class. A start on laying REPULSE’s keel plates was made on the last day of November 1914 and shortly thereafter Lord Fisher, back at the Admiralty again as First Sea Lord, began agitating for designs of a battle cruiser type that incorporated lessons he believed had been pointed up by the recent battle cruiser successes at Heligoland Bight and the Falkland Islands. Fisher was convinced that ships with a speed of at least 32 knots (to be achieved by oil fired boilers), a long, relatively shallow draft hull with high flared bows to keep vital gunnery positions clear of spray when at speed, six 15 inch and twenty 4 inch guns and an appropriate thickness of armour protection would produce a capital ship of irresistible potency. No mention, it seems, was included by Fisher for the ships to have specific potential for Baltic operations. On Christmas Eve 1914 a scale model was unveiled for inspection by the First Sea Lord and shortly after Christmas the shipbuilders were awarded contracts to build two of this new type. Progress was snappy in those days - but then we were at war! The two battleships RENOWN and REPULSE, in early stages of construction, where forthwith cancelled and their names given to Fisher’s new battle cruisers: John Brown on the Clyde won the order for REPULSE whose building proceeded apace, and her hull, 794 feet long overall and weighing 11,000 tons, was launched on 8th January 1916. The Battle of Jutland was by now less than 5 months away and when the new ship proudly made her appearance at sea just a few short weeks after Jutland - when a third of the Royal Navy’s battle cruiser force had been destroyed - it was to pursed lips: beautiful, symmetrical and impressively large she may have been , but to seasoned eyes she was clearly short of that attribute now, post-Jutland, considered vital: armour. Immediate modifications to deck armour were accordingly carried out and while they were at it, the forrard funnel in both ships was raised by 6 feet, the familiar problem of smoking out gunnery control tops and compass platforms having arisen on sea trials. Several months later yet more armour was added, about 500 tons in all being fitted to the crowns of magazines and over the engine rooms and when REPULSE rejoined the fleet, although her protection credentials were still being questioned, she was nevertheless a welcome addition to the Grand Fleet’s strength. 1st October 1917 saw REPULSE gain a world first: from a platform on B turret she launched Squadron Leader Rutland in his single seat Sopwith Pup fighter, a feat successfully copied by Y turret some 8 days later. A month after that the new ship was briefly in action in the area of the Heligoland Bight and then in November 1918 came the armistice: the two new battle cruisers could now at last be spared for further, more major, modifications to their armour. REPULSE duly entered Portsmouth dockyard on 3rd December for a 25 month refit during which, amongst other modifications she received, was an armoured belt along the hull (this was henceforth to mark her out from RENOWN who received only anti torpedo bulges). The busy interwar years were spent as a member of the Battle Cruiser Squadron and wearing the Standard of HRH The Prince of Wales: there were few major ports of the world that did not become familiar with the ship’s beautiful and powerfully symmetrical lines. She underwent a big modernisation in the 1930’s and her profile was, if anything, improved even further though when war was again declared in 1939 there was no disguising the fact that she and RENOWN - refitted to a higher degree – were no spring lambs! When REPULSE and the new battleship PRINCE of WALES were caught without air cover off east Malaya in 1941 by Japanese torpedo bombers it was perhaps surprising that the old ship lasted as long as she did: after a magnificent fight during which Captain Tennant deployed every evasive trick in the book and put the battle cruiser through her paces as never before, she was eventually overwhelmed and joined her consort at the bottom of the South China Sea. Fought fiercely to the end, loss of life was heavy and those who were not initially drowned in the sinking found themselves defending Singapore Garrison as the Japanese overran the island. Many of those who survived this further ordeal then faced a yet more ghastly fate: prisoners of war in Japan and Burma where yet more died.